The OrthoMab technology can generate bispecific antibodies from any two existing antibody sequences. OrthoMab antibodies are produced with standard antibody production and purification techniques, obviating the need for poorly behaved antibody fragments (i.e. scFv) or complicated post-processing purification steps. Through a suite of bispecific antibody formats that vary critical molecular properties, lead agents can be tailored to specific target biology and mechanisms of action. How does the OrthoMab technology work? What is needed to start a Collaboration with Dualogics? Any two antibody sequences can be combined with OrthoMab to create a bispecific antibody. 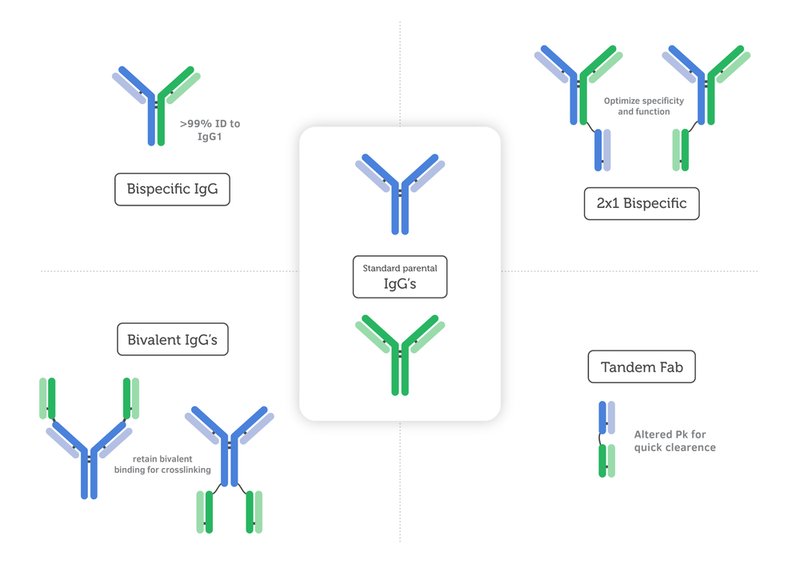 Dualogics has created bispecific antibodies using variable domains derived from a variety of libraries and host species. How are OrthoMab antibodies produced? OrthoMab antibodies are produced in mammalian cells by transfecting the DNA for each unique antibody chain into a single cell, similar to how traditional monoclonal antibodies are produced. Our technology allows for the correct product to assemble inside the cell and be secreted. These molecules are compatible with single stable cell line production and standard purification methods (e.g. Protein A-based purification). Lewis, S. M., Wu, X., Pustilnik, A., Sereno, A., Huang, F., Rick, H. L., … Demarest, S. J. (2014). Generation of bispecific IgG antibodies by structure-based design of an orthogonal Fab interface. Nature Biotechnology, 32(2), 191–198. Wu, X., Sereno, A. J., Huang, F., Lewis, S. M., Lieu, R. L., Weldon, C., … Demarest, S. J. (2015). Fab-based bispecific antibody formats with robust biophysical properties and biological activity. mAbs, 7(3), 470–482. Leaver-Fay, A., Froning, K. J., Atwell, S., Aldaz, H., Pustilnik, A., Lu, F., … Kuhlman, B. (2016). Computationally Designed Bispecific Antibodies using Negative State Repertoires. Structure , 24(4), 641–651.